Preheat the oven to 400 degrees F. On a small, parchment-lined baking sheet, spread out the florets of broccoli. Toss them with about a tablespoon of olive oil and a few pinches of salt and pepper. Transfer to the oven to roast for 15 minutes, just until they're bright green in color. Remove from the oven and set aside. Meanwhile, in a small saucepan set over medium heat, add the butter. When the butter is melted, pour in the flour and mix until a paste forms. Cook the flour/butter mixture for about a minute, stirring the entire time. Pour in the milk and whisk vigorously.Stir in the minced garlic and bring the mixture to a gentle simmer, until the mixture has thickened and coats the back of a wooden spoon, about 3-5 minutes. Turn the heat off and stir in 3/4 cup of the grated Gruyere cheese, along with salt to taste (I added about 1/2 teaspoon of salt) and a few pinches of black pepper. To assemble the tartines, place slices of bread on a baking sheet. Divide the broccoli between the bread. 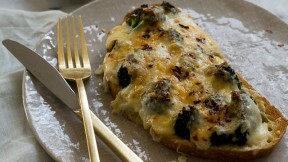 Spoon a few tablespoons the béchamel sauce over the broccoli and top with a handful of Gruyere. Sprinkle the tops with a few pinches of red pepper flakes. Place the tartines under the broiler (being sure to watch them the entire time!) and bake until the cheese is melted and lightly golden brown, about 3-5 minutes.